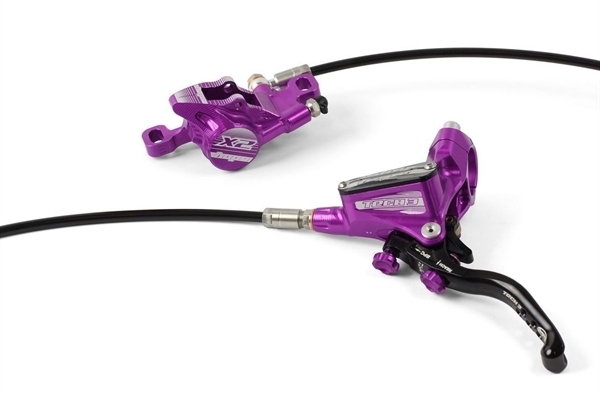 Product information "Hope Tech3 X2 Disc Brake RW purple"
The Tech 3 Lever and X2 caliper combine for the benchmark XC brake. "The Tech 3 X2 brake takes the performance of the award winning Mini and sheds a few more precision grams without compromising on power and modulation Tech 3 lever offers genuine bite point and reach adjustment without tools Uses post mount, 9.74 caliper with adapters to suit all mount options CNC machined from 2014 T6 aluminium alloy Wide angle hose connector mount Top entry pad fitting Shimano I-Spec A shifters can be fitted directly to lever body. Separate direct mounts also available for Shimano I Spec 2 & Sram shifters Available to fit 140, 160,180, 183, 200 & 203mm rotors Weight from: 249g (standard hose), 287g (braided hose)"
Related links to "Hope Tech3 X2 Disc Brake RW purple"
Customer evaluation for "Hope Tech3 X2 Disc Brake RW purple"